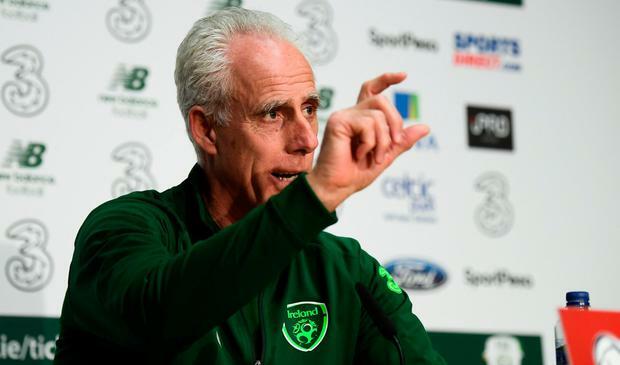 We have been in the doldrums for some time, but Mick McCarthy says he wants to bring Irish football to a place of perfection in his second spell as Ireland boss. His recipe is a thing called FAAIP, not as catchy as, say, GUBU, and unlikely to catch on, but something he wants to see all the same. "Fast, attacking, aggressive Irish performance," he says when asked to describe how his Ireland side will play. But the destination is all that matters: utopia, where results and good football come together. "Wouldn't it be wonderful. It's utopia, playing well and winning. Winning is not far off utopia, I reckon. But winning and playing well is a lot better. It would be nice to do both," says McCarthy, enthused by the opening game of Stephen Kenny's reign as U312 manager on Sunday, a 3-0 win over Luxembourg for his debut. "I watched the 21s. That was a great performance and result. It would be nice to play as well as that and get a similar result. "But let me tell you. You are all asking me these questions. You have seen more of Georgia than I have. And you all know what a damn good team they are. You all know it. And you are asking me questions to find out something else that I know that you don't. And I don't, except they are a good team." Two players in the Ireland camp could be expected to have different moods since events in Gibraltar on Saturday. Jeff Hendrick was on a high after scoring only his second-ever international goal. But Sean Maguire had a grim night, the striker joking that he wasn't even getting chances on goal, let alone goals. Hendrick has been used in a series of positions, some of them ill-fitting, in his Ireland career but McCarthy says he sees a central midfield role as being nailed down. "He's a central midfield player. I saw him playing there for Derby and we tried to take him at Wolves," says McCarthy. "Wherever else he's played for his club, Sean (Dyche) will have used him where he sees best, if you need someone to fill in, we all do that. "I think if you're six-foot athletic midfielder and you get in the box - the finish he produced on Saturday with his left foot was pretty excellent - then that's where he'll play for me. Definitely," added McCarthy, hoping that the security of tenure in the side could bring more from Hendrick. "If you're playing in a position that you like, then generally it does get the best out of you. He's comes in here and said that's where he wants to play. "I thought he had a really good relationship with Conor (Hourihane) and he's a threat, a real threat, when he's running forward. One goal in one goal is not a bad start for him." But Maguire could have done with something of that order in Gibraltar. "I don't think we got the best out of Sean with some of the service. The ball was bobbling about at his feet and it was horrible. Let's clear that up," says McCarthy. "He needs the ball down the sides of him and the best performance I saw from him was at Millwall when they struck the ball up the sides of him. "He's a runner so that's when you get the best out of him. He's quick and athletic and if we can get him slid inside anywhere in the box, then he's a threat and will score goals. "It was difficult for him on Saturday. There wasn't much room on the pitch and he had to come for the ball which was being hit in at pace so it was difficult to control. "So I don't think we got the best out of Sean. I have just spoken to him and he knows that. He said that he was as nervous as he has been, strangely enough." And strangely enough, McCarthy admitted that he had a dose of nerves too, akin to his debut as Ireland manager all those years ago. "Of course I was nervous in 1996, and I was very nervous on Saturday because of the nature of the game," he revealed. "Too right I was. Before the game in Gibraltar, the butterfly was walking around with his boots on. I was nervous. "And I hope that does not go away because I don't want to lose that. I will be nervous tonight, of course."